Boo is a five-year-old Pomeranian that believe it or not currently has a higher number of fans than most celebrities. He shot to fame after his personal Facebook page reached a fan base of 1.79 million fans! When you take a look at Boo it is easy to see why he has the whole world talking. His fluffy bear like face cannot be overlooked and even famous celebrities such as Khloe Kardashian have admitted to being weak at the knees after their Boo encounter. Boo received his unique look after a grooming session gone wrong, which turned out to be a blessing in disguise. The groomer believed that his hair had become so knotted that shaving him was really the only option. Boo's owner was horrified, yet quickly changed her mind after seeing how cute the haircut actually looked. 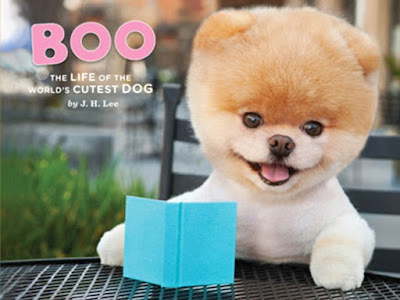 Boo has now released his own book which is titled 'Boo, the life of the world's cutest dog' and spends his days busily promoting the exclusive biography. The book is a collection of exclusive photographs of Boo doing all his favourite things and with his unforgettable puppy dog eyes the book is no doubt set to be a top seller! Check out Boo in action making his new book.